Rosé seems to be at an all time high right now in popularity. It’s everywhere! 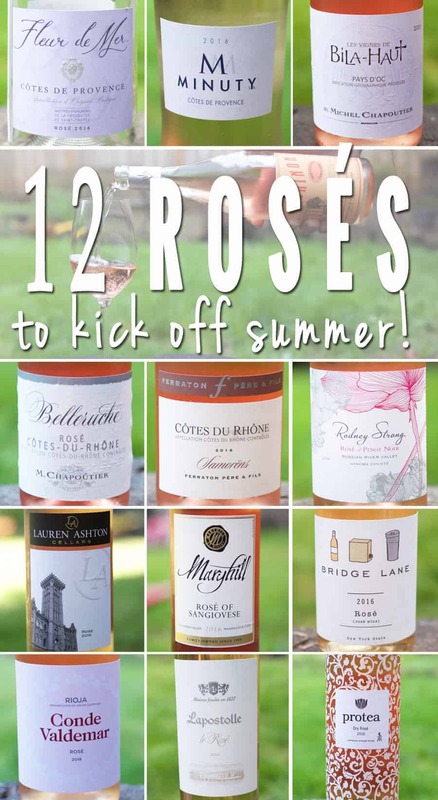 And, as an avid year-round rosé freak lover, I couldn’t be more excited. Today we have a review of a new book on the subject, and 12 rosé recommendations to jump start your summer sipping. Just this spring three new books came out on the subject! THREE! While I haven’t read all of them, I have read Rosé Wine: The Guide to Drinking Pink, and I found it both fascinating and informative. In her comprehensive book on the subject, Jennifer Simonetti-Bryan, Master of Wine, teaches us to distinguish all of the amazing flavors of rosé, from bitter, sweet, sour, salty and umami. 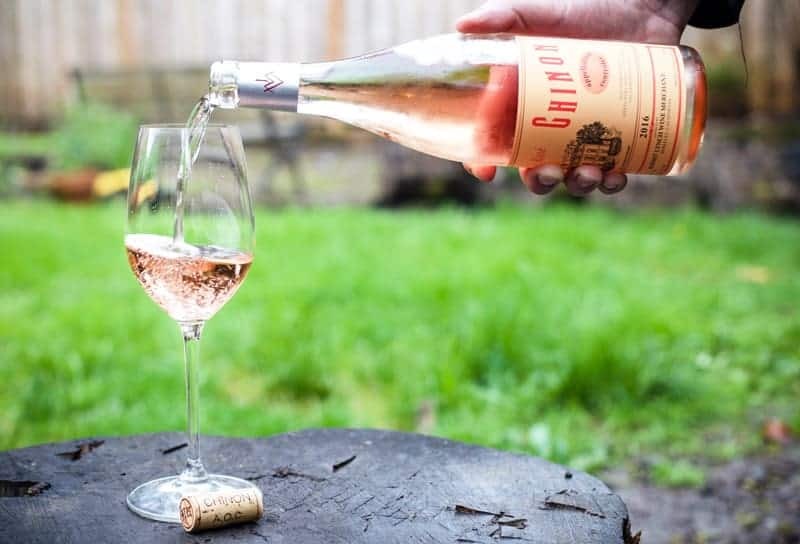 Simonetti-Bryan describes the different styles of rosé, from bone dry to sweet, and the grapes used to make this style of wine all around the world. And my favorite part… THE QUIZ! In it she has the reader take a quiz on taste preferences to determine which style of rosé you might like best. No, we’re not back in school being tested, this is a fun quiz. She asks questions unrelated to wine preferences, like if you prefer cream or sugar in your coffee, if you like lemon on your seafood, if you prefer dark or milk chocolate, mint or fruit gum, etc. While these questions may seem unrelated to wine, they can help you determined what your preferences are when it comes to the various styles of rosé. And it works! I’m usually skeptical of these things, but she nailed me to a T (and my husband, and friends I made take the quiz)! I appreciate that quiz because rosé is made all over the world, in all styles, so it can be tricky to determine which ones you might like (and from where). Since each style is present throughout the world I think it’s more important to determine your personal style preference, then you can find the wines you might like. Regardless of where they are made in the world I find myself gravitating towards that “crisp” style she mentions (think Provence style. Dry, light, fresh.). And most of the wines below fall into that or the “fruity” category. Whatever style you prefer, I’m just thrilled to see so many people loving pink! And when it comes to rosé no mater where it’s from it is one of the most versatile food pairing wines in the world. Period. And it’s not just a summer drink. I drink the pink stuff year-round, but it’s summer where you’ll find it everywhere and in abundance. So let’s take a quick world tour with one of my favorite styles of wine. *And quick note, you won’t find any pink bubbly here today, nor any Oregon rosé. Don’t be sad! We’ll be updating you with our favorite local rosés throughout the summer. And for the bubbly, be sure to check out my Instagram posts every Friday for my favorite sparkling wines of the week. This was spot on for its style. Fresh with mandarin orange, Meyer lemon, a little bit of grapefruit, and some strawberry flavors. There’s also a nice feeling of minerality throughout with some chalky limestone hints. We were definitely fans of this one and will happily pick some up next time I see it. Another one spot on for the Provencal style. A blend of Grenache and Cinsault it’s light, with a touch of fresh citrus, lemon peel, bright strawberry, and even some mandarin orange flavors. Fresh, bright, and lovely. I’ve had this wine year over year and it’s pretty consistent. Easy drinking with some lemon zest, cherry, fresh strawberry flavors. It’s fairly simple, but good for everyday sipping. Not sure I’d buy a bunch for $15, but if you can find it around $10 (which is the price I usually see it for) it’s a good deal! This blend of Grenache, Cinsaut, and Syrah is always a pretty consistent and solid buy, and this year is no exception. I can usually find it for around $10 and it’s a nice fruity style wine to pop open on a hot day or if your neighbors stop by unexpectedly. You’ll find fresh strawberry, some citrus, and blood orange flavors. For this price you can keep it well stocked all summer long. 75% Grenache is blended with Syrah and Cinsault, this one is bright, fruity, and straight forward and easy drinking with a strawberry focus. There’s also a little citrus in there along with some herbs and a pinch of peach. Give it to me for $10 or less and I’m ready for a pool party. This has been one of my favorite rosés of the season so far! It’s so fresh and nicely balanced. It’s elegant and fresh with cherry and strawberry fruit with a touch of tangerine. I love the bright acidic backbone in this wine throughout. Light bodied, this is one I would happily sip on all summer long. I loved this blend of Grenache, Mourvedre, and Counnoise. I was expecting something bigger and richer from the color and region this wine was produce, but was pleasantly surprised at how light and fresh it was. Bright strawberry and raspberry with bright acidity, and a dry finish, this wine is versatile enough to be a poolside sipper but has enough flavor to stand up to pizza night or even grilled chicken. Another welcome surprise from Washington. This one definitely falls into that “fruity” category. You’ll find all sorts of red berry flavors (lots of black cherry and strawberry) and watermelon, a touch of candied without being in that sugary bubblegum category. Expect just a touch of sweetness on this one, with enough acidity to balance it out. I’ve seen this one locally for as low as $10. I’d snag a couple bottles for summer parties at that price, as this will appeal to the masses on a hot summer day. Straight outta New York! This is the second label of Long Island’s Lieb Cellars, and this rosé is super refreshing and fun. It’s also a very interesting blend of Cabernet Franc, Merlot, Pinot Blanc, Riesling and Gewurztraminer. It’s got some tropical fruit, some red berry fruit, a little bit of citrus, even some watermelon going on. If you can find it give it a shot! Made from 70% Garnacha and 30% Viura this was light, fresh, and savory with strawberry and raspberry fruit. Balanced and pretty straightforward, with a nice salty minerality on the finish. Would be nice with light salads, appetizers, or prosciutto wrapped melon. This was a good reminder about proper serving temperatures. We poured this one a little too warm, lacked acidity, and seemed lackluster. But when we popped that bad boy back into the fridge to get colder it really shined. It now had bright citrus, floral notes, and some mild berry. It’s pretty light, bright, and fresh. Serve your rosé properly chilled, yo! A blend of Mourvedre, Shiraz, Cinsault, and Grenache this one is quite interesting. It’s not your fruity or sweet style at all. Instead it’s more citrus, herb, and floral focused. It’s light, fresh, and dry, with some lemon peel and lemon oil. It’s a nice counter balance to the fruitier styles mentioned above. Salty, savory, floral, and delightful. This would be a fun one to experiment with food. Could go with more savory things, or even seafood like oysters or mussels. What have been your favorite rosés so far this season? *This post contains affiliate links. Most of these wines were were media samples for review. See my affiliate and sample policy here. Wow! SO many rosés I have not tried yet – Time to get busy! Thanks for these recommendations Mary! I tend to lean towards the Provence style rosés (like you) but love them all (except the sweet variety). I have always been pretty anti-rose, but I think that’s because I always end up drinking fruity ones—but I’m a crisp kind of a gal. I’ll look for ones that fit that description so I can get into the pink craze, too!